Some days things just don’t go as planned, you know what I mean? I spent ages fluffing and puffing up a bunch of paper pompoms from a set I had snagged off of Amazon for CHEAP a while back ago to put them in my Christmas tree. But then this morning I’m thinking about it and I am just not feeling it. The colors are good and all and since they’re already paid for they fit into my whole “too cheap to buy anything for Christmas crafting 2017” self imposed mission but when I woke up and saw the basket full of ’em I just though, blah. You see everything else I’ve made so far is so BRIGHT and VIVID and SO MANY COLORS and these just didn’t fit with what I have in my head for my finished Christmas tree. 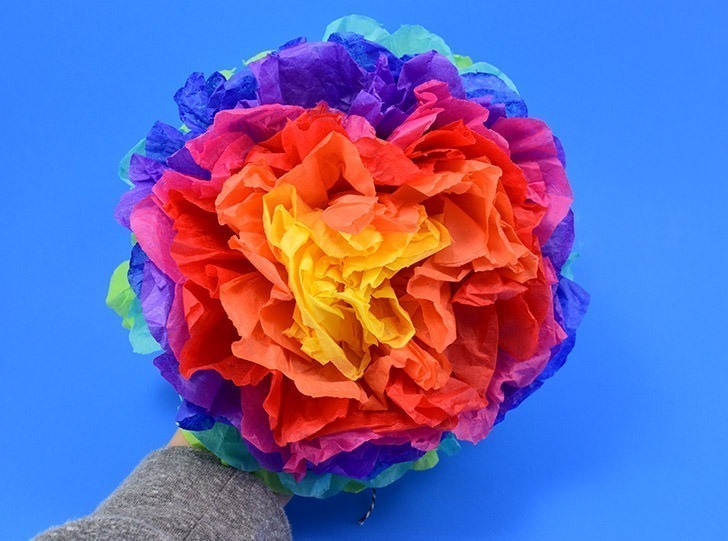 And since it’s not like making tissue paper pompoms or tissue paper flowers (technically half a pom), are all that difficult to make and so I decided it was time to pull a crafty mulligan. And so I got out of bed, dug around the ridiculous garage craft stash for my tissue paper and pulled out a particularly pretty rainbow assortment. Since it was still early I went right back to bed and started playing around with the idea of something more colorful. More rainbow. More awesome. I texted a pic of my new and improved tissue paper pompoms in my pajamas on top of my quilt to my mom and sister wondering if they thought it was as awesome as I did. 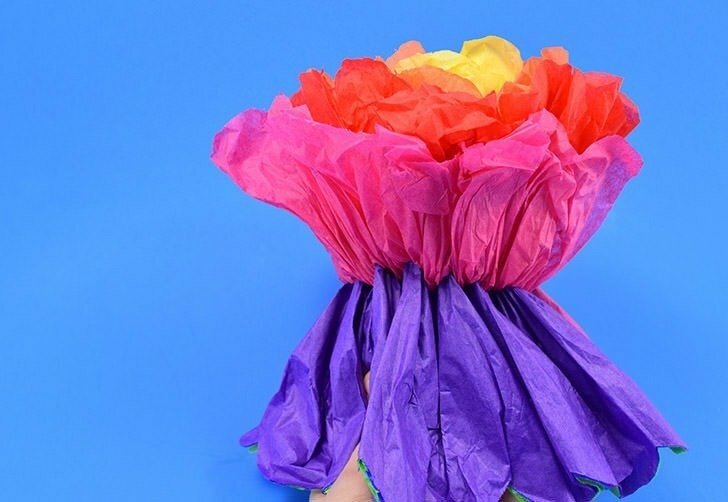 Is this rainbow flower amazing or tacky? 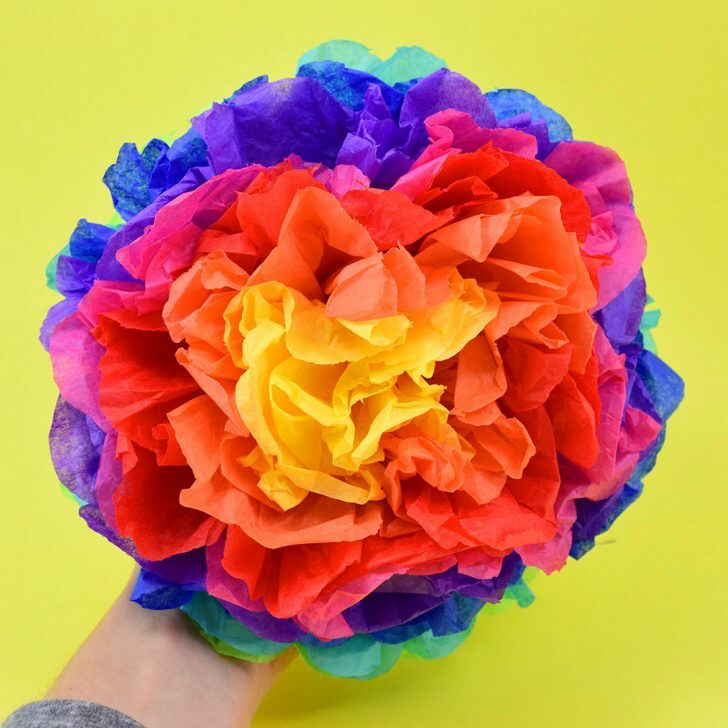 My mom pinged me back pretty much instantly saying the newer, more colorful pompom flower was “absolutely beautiful” and that “the solid flowers are beautiful but the rainbow stands out.” And so I spent today making more colorful rainbow tissue paper pompoms and I’ve got to tell you at the end of this day, I’m so feeling it. I’m so excited because these little paper pompoms are perfect. Whether you go rainbow like I have, or if you go for solid colors (because a wedding typically is more sedate in color scheme than all of this, right?) 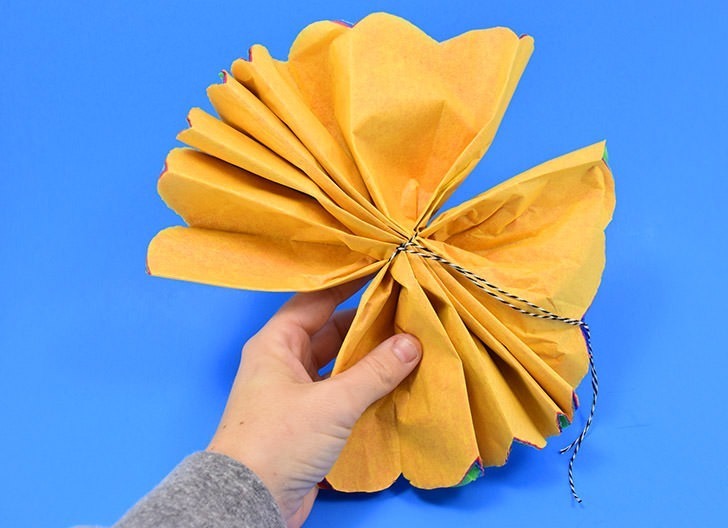 these big puffs of tissue paper are easy to make, super inexpensive and great filler for your designs for home decor or parties and, heck, even will fill those annoying holes you can’t fluff your way out of on an artificial Christmas tree. And if you’re short on time, buy one of these sets because it’s a really good deal and goes a bit faster. Ready to get it? 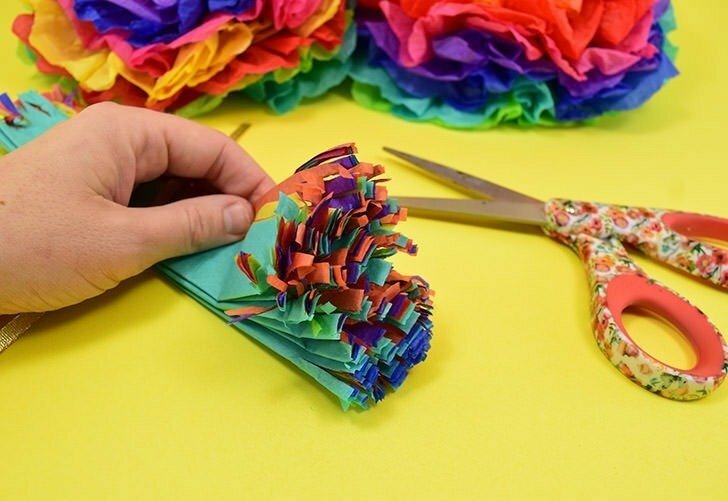 Neatly stack together your tissue paper, making sure all corners and edges meet, in the presentation you’d like it to be in your pompoms. I went with a rainbow gradient from yellow to green. 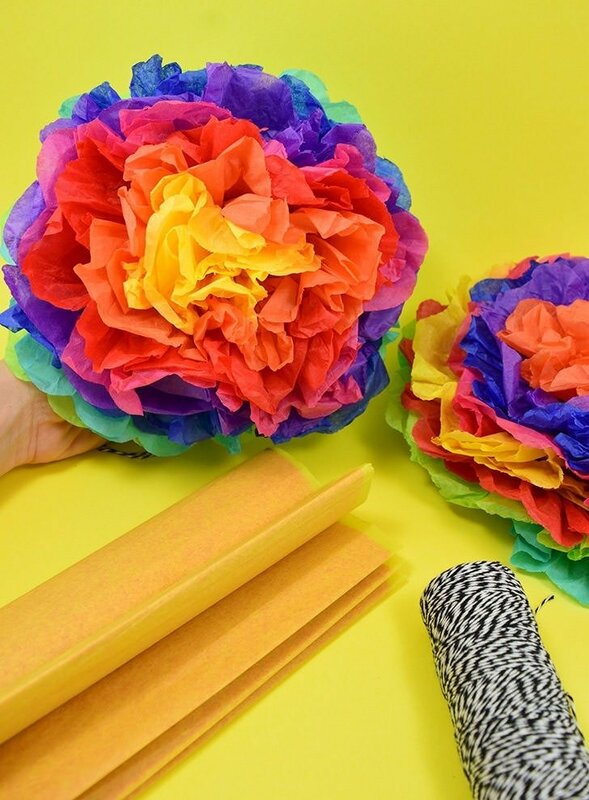 I used 8 sheets for my half pompoms (used as flowers rather than poms). Six would have worked well but would have left out some of the colors I was hoping to use so I stuck with the 8. 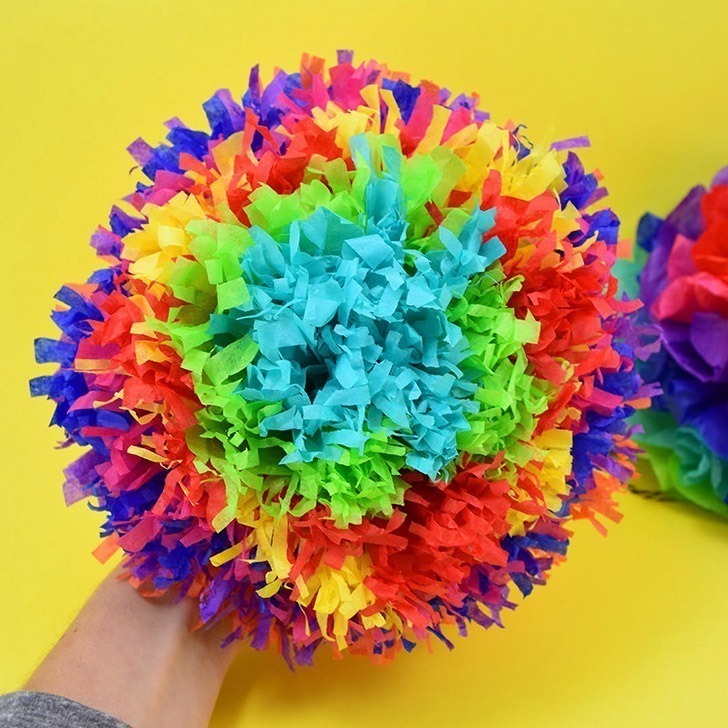 For a full pompom with a nice, round shape, I’d suggest using 12 sheets of tissue paper, give or take a few. 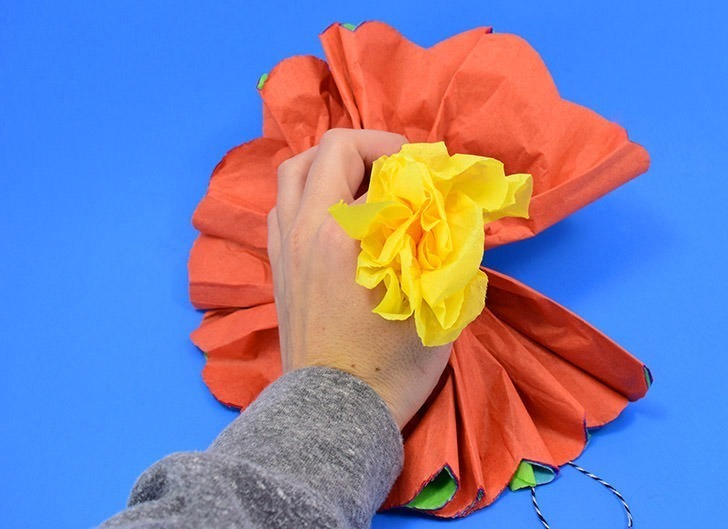 Trim the edges into a round shape for a pretty scalloped flower. 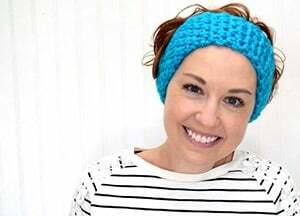 Or fringe the edges about an inch in for a more traditional pompom type of look. 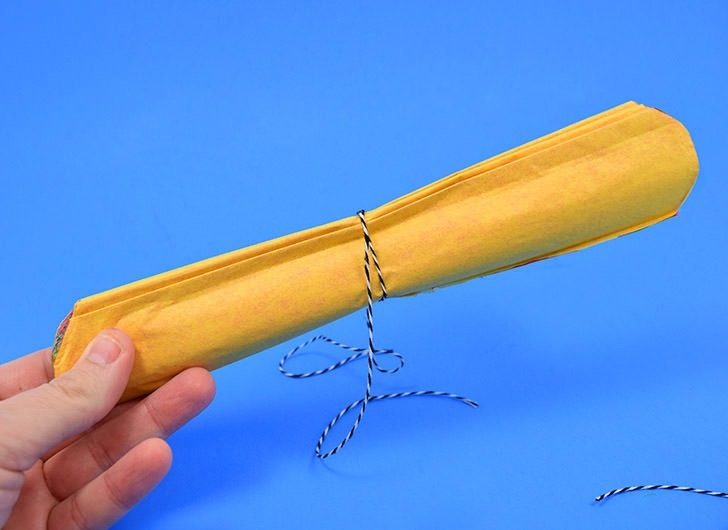 In the middle of your accordion pleated paper tie a piece of ribbon or string. If hanging as pompoms you’ll want to have enough length here to easily do that. Fan out both sides of the paper as best you can. 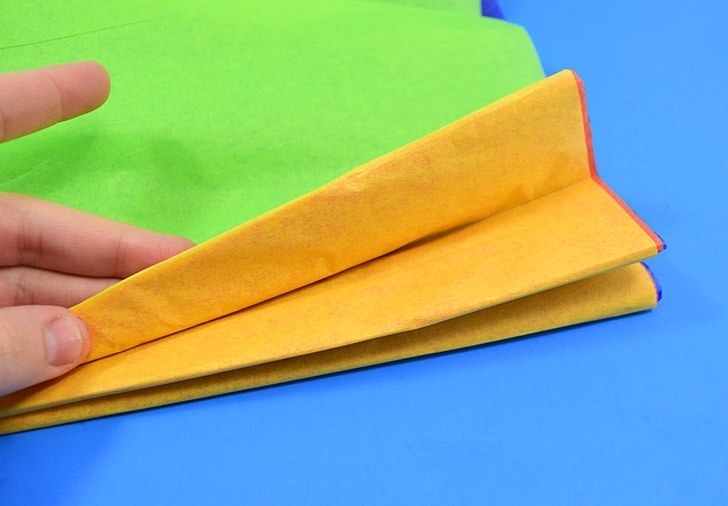 Gently pull up the tissue paper one layer at a time. 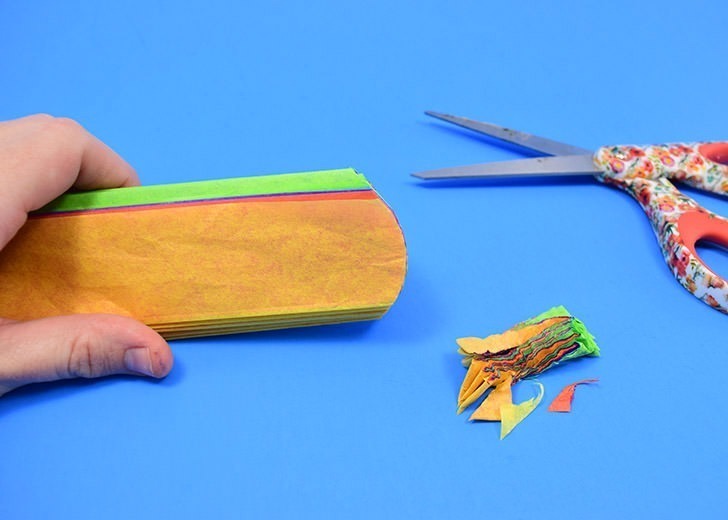 Start from the sides of the paper rather than the ends to help prevent tearing. pull up and toward the center where you tied the whole business together. 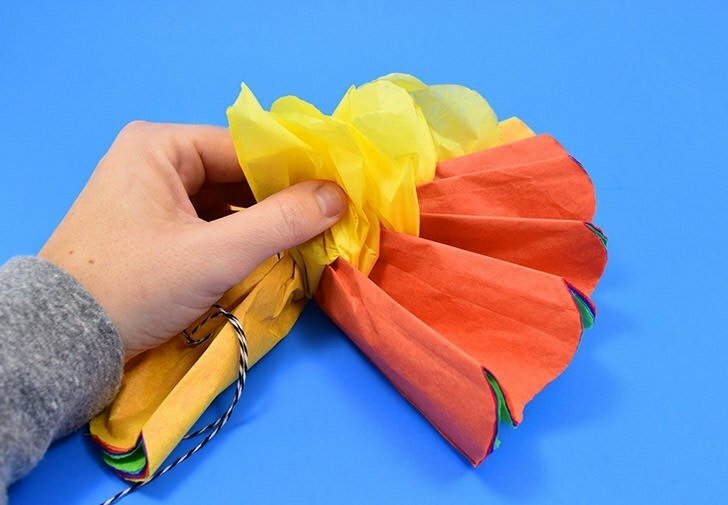 Once both sides of your first piece of tissue paper have been fluffed up, pull them together in the center. Continue pulling the sheets away from the mass, fluffing up and spreading around the previous layer. See how the flower shape is forming? Because I want only half a pom, so these guys are like flowers, I’m pulling everything up. If you want a rounded pompom, once you’ve reached the halfway point, which it looks like I’m there or nearly so in the pic above, it’s time to start filling out the other side. I prefer to flip the whole business over working outside to inside starting over just like we did at the very beginning. Isn’t it so pretty? I’m am really, really loving the rainbow ombre business going on here! And that fuzzy pompom business is just too cute, isn’t it? I honestly can’t decide which one I love more but I do know that these are going to be AMAZING on my Christmas tree. Yep these guys are actually going on my Christmas tree and I’m super stoked because I have tons of tissue paper in the stash making these guys cost me NOTHING.